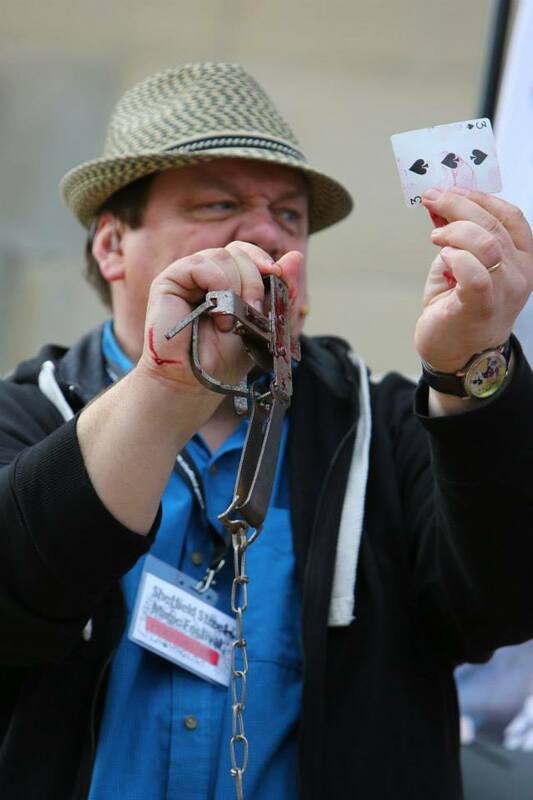 Tim Smithies brings The World’s Most Dangerous Card Trick to a (reasonably; that’s real blood) successful conclusion during last year’s Sheffield Street Magic Festival. Saturday 1 November: Magic in the streets, 12:30 – 4:00. We have three 6 x 3 m gazebos (twice the size of last year). The area in front of the Town Hall will be the main focus for the street magic with Barkers Pool and Fargate as secondary sites. Bad weather provisions are being organised. Two ‘junior magician workshops’ are being held on the Saturday afternoon in the Town Hall. Times to be arranged. Sunday at 7:30: Full evening show in the Library Theatre. There’s a press call/photo shoot to promote the event (part of ‘Out Of This World’ this year, but if all goes well, next year…) in the Winter Garden this Wednesday. Please help make this event one to remember. Last year’s was a great success, and I’m hoping we’ll get the same enthusiasm and feedback as we did then. It’s a great boost for magic in Sheffield. We need performers, of course, for all the events, plus people to help behind the scenes (including front-of-house staff for the evening events) and helpers/teachers for the junior magician workshops. The usual stalwarts have offered their services, and I’m hoping that we’ll get the same enthusiastic response that we did last year. There is, of course, not a lot of cash involved but we’ll make sure that everyone taking part will get a share of what is available, as well as the satisfaction of taking part in what should be a fabulous weekend of magic.